"But clearly he has shown us and has confirmed his status as a great sprinter. I think he is now much more confident and convinced about what he can do. We will surely see much more from him." Juan Jose Lobato's season has not been unnoticed by his Movistar team. The fourth place at Milan-Sanremo proved that the Spanish sprinter has great potential for the coming years. His and the team's problem is that they are mainly focused on the grand tours and will have a similar focus in 2015, with Nairo Quintana and Alejandro Valverde being the clear leaders. General manager Eusebio Unzue is vert satisfied with Lobato's performances in his first season at the team and expects him to continue his progression. "This year he has already done important things and sometimes not everything can be quantified in wins. Some of his wins have been spectacular; and there have been days when he has been prevented from winning by bad luck, by small details which influenced a sprint. But clearly he has shown us and has confirmed his status as a great sprinter. I think he is now much more confident and convinced about what he can do. We will surely see much more from him," Unzue said at a recent press conference in Pamplona. Unzué admitted that sprinters have never played a big role in his teams which have never worked to ensure a bunch sprint and always been focused on the GC in the Giro, Tour and Vuelta. This philosophy will not change but it doesn't mean that they will not count on Lobato. "This is not an ideal team for sprinters because the culture of the team have never had that focus. We have almost always looked at the sprint stages as some kind of rest day. However, both we and his teammates are convinced that he can take a big step and achieve a very important victory next year," he said. In 2014, Lobato, who turns 26 in the Christmas holiday, took two victories in the Tour de Wallonie and the Vuelta a Burgos and had seven second places in Dubai (behind Kittel), Almería (Bennett), Sarthe (Ahlstrand), Switzerland (Cavendish), Austria (two behind Gatto) and in the Tour de Wallonie GC (Meersman). In Sanremo, only Kristoff, Cancellara and Swift prevented him from stepping onto the podium. 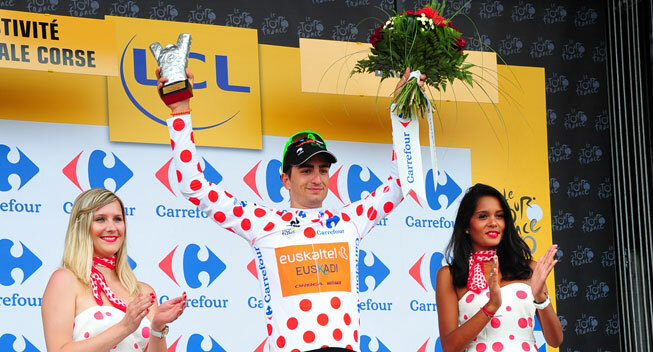 Lobato rode for Andalusia in 2011 and 2012 and made the jump to Euskaltel-Euskadi in 2013. He had signed a two-year contract but when the Basque team folded he joined Unzue after having initially reached an agreement with Caja Rural.